MP3 players are all over the place. It seems that you can’t walk down the street or get on a bus train or plane without seeing someone plugged into a pair of headphones. These players are so much more versatile nowadays though and there are plenty of add-ons and extra options that can be used to increase their usefulness and usability. Sadly not all MP3 players are created equal and not all the accessories are interchangeable. Some MP3 players have special connections that mean you can’t use all the various accessories and extras with them. Make sure you check and then double-check that the accessories you’re about to buy to make certain that it works with your particular device. Speakers are the most obvious add-on to an MP3 player. You can then share the music on your device simply by plugging it in and using it as normal. You can get portable speakers that you can take with you on holiday and days out or full size hi-fi equipment. The portable speaker systems offer flexibility but the audio quality isn’t all that fantastic and can drain the battery on your MP3 player quite quickly. The full-size hi-fi style speakers give much better audio quality and often include chargers and remote controls. The batteries on portable MP3 players are notoriously bad. Just when you’re getting in to the swing of things the audio cuts out and your device goes dead. Luckily you can buy a battery accessory that you plug your MP3 player into that adds a battery to the MP3 player to keep you in music for longer. Basically it’s a battery that you charge and keep with you so when the power inside your MP3 player goes flat you simply slot it into the replacement and keep going. You can now also buy short-range FM broadcasters for your MP3 player. It won’t turn your MP3 player in to a radio station but it will allow you to tune your car radio directly into your MP3 player. You plug a transmitter into your MP3 player and then tune the car radio and you can listen to the audio on your MP3 player without the need for messy cables or expensive integration kits. In addition to an MP3 FM transmitter it might be worth getting an in-car charger. These plug into the cigarette lighter socket and keep your battery charged when you’re on the go. 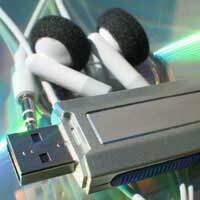 In addition to the on the go stuff there are some great home based accessories for your MP3 player. One of the most popular things is the alarm clock. It turns your MP3 player into a bedside alarm clock so that you can wake up to your favourite tunes rather than the radio. There are so many accessories for MP3 players that whole stores dedicated to add-on kit are being opened all the time. As well as the various things mentioned above you can get cases to protect you MP3 player and covers to change the colour of the device. All the various accessories that are available will add to the flexibility of your MP3 player.